On the surface, Hurley’s startling piece appears to be simply a surprising blend of storytelling and techno music. These unlikely bedfellows are harnessed to relate the distinctly ordinary narrative of Johnno McCreaddie, a fifteen-year-old boy growing up in Livingstone who becomes entangled in the rave culture of the early 1990s, while at the same time policeman Robert wrestles with the day to day demands of his job and the insistent, disappointed ghost of his father. 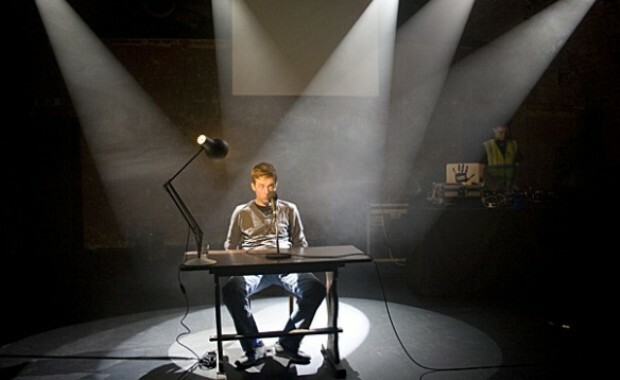 Yet Beats is, in its own pulsing, unapologetically noisy way, one of the most invigorating pieces of recent political theatre. It’s a strobe-lit love song to the radical potential of the collective act of imagination, the live sharing of thoughts that can’t be clubbed or cuffed. Although speaking deafeningly to the disillusioned present moment, Hurley’s narrowed focus is 1994 and the Criminal Justice Act’s bizarre outlawing of public gatherings to listen to music that consists primarily of “the emission of a succession of repetitive beats”. Collected in the Bush Theatre to the pounding soundtrack of DJ Johnny Whoop, we are – according to this definition – breaking the law. Hurley, an unassuming but fiercely captivating performer, flirts with this idea of transgression and with the lines drawn between real and imagined in the space of the theatre, playfully suggesting that because it’s not real its criminality doesn’t really count. While Hurley’s characters are vividly drawn and fleshed out by his morphing voice and physicality, much of the weight that gathers behind this simple narrative is reliant on the sound with which it is intertwined. Audience members become auditors in the most literal sense, as the piece channels the power inherent in music and its force to bring people together against the atomising efforts of those in authority. The integral beats of the title are not just beats of music, but beats of the heart, beats in time, the very stuff of humanity and of history. From the exhilarating rush and noise of the show Hurley has crafted, one grinningly rebellious anecdote sounds a note above the rest. In the immediate wake of the Criminal Justice Act, one of Johnno’s mates explains how the song blaring from his car speakers has no repetitive beats at all – not one. Each series of beats follows a different rhythm, scattering logic. If they had a rave and only listened to this one track, the boy continues, no one could legally arrest them. It’s a fitting analogy for the subversively chameleonic nature of resistance, which will constantly find new ways to push against imposed systems from within, often using those systems’ own apparatuses. It also speaks to Hurley’s own recycling and reinvention of the essentially traditional form of storytelling in which he is working, visually hinted at by the rather old-fashioned wooden desk at which he sits and its juxtaposition with the light and sound enveloping it. As Johnno puts it upon entering his first rave, “it’s been done before, but not by me” – a fresh sense of novelty that Hurley manages to inject into his mode of narrative, generating a kind of optimism in the ability of political theatre to shift and evolve at the same pace as its circumstances. As the pulsing sound and lights finally dim, what Beats leaves us with is a collective conviction that this matters. Hurley’s closing refrain, the piece’s own pulse and repetitive beat, rings out as a subversion of the criticism so often levelled at the seemingly marginal activities of political theatre: it doesn’t mean nothing. A simple, casually deployed double negative delicately inverted to reveal its true meaning. It doesn’t mean nothing.